The layout is copied, but the triggers were partly rewritten by me. In addition to the original version by Pender I made an huge bugfix to the thunderclap ability. since version 2.9 the ability will consistently hit around 250 distance. Please read the overview of your settings after choosing a game mode! Depending on the mode you choose, you either have to get the longest, shortest or an given (expected) time with your maze. In random mode you have to get the most points by reaching the individual goal each round. 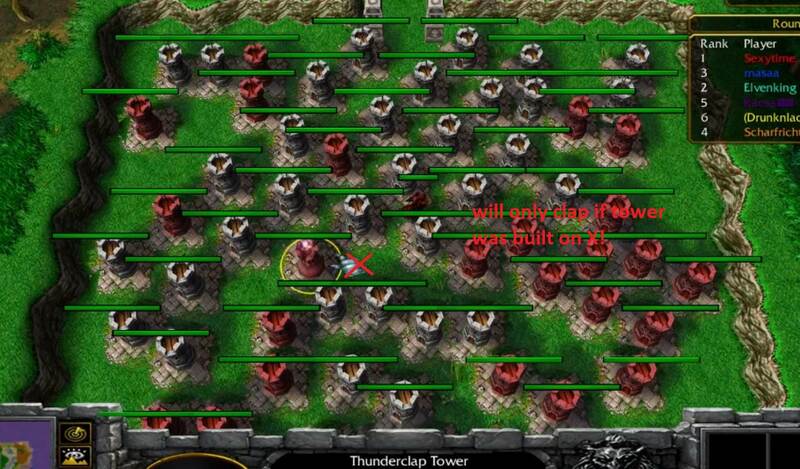 Speedtower: 1-3 towers are spawned which increase the speed of your runner. Reach the longest time and avoid or negate speedtowers. Penalty: unspent ressources will give you a time penalty (more player resources). Random: each round is randomly 1 of the 5 standard modes. Reach the individual goal and get the most points. Points are given according to your performance. Infinite rounds: It is not really a game mode, but I want to metion this here too. In the game options you can select ? as rounds (total time mode). This means that the game has infinite rounds and will end if no player has build time left. The uniqueness of this option makes it to a "sub-mode" where you have to be as fast as possible in every mode. Rounds: Total number of rounds to play.
? means infinite rounds (only in total time mode). Time: Building time you have. Can be set per round or as total time depending on the choosen time mode. Time mode: You can choose between round time or total time. In round time mode every round has the same building time (constant). In total time mode every player has an own timer for building. It is important to end the round with the "ready" button in total time mode. If a player runs out of building time he has to wait until the game ends. Hint: In total time mode you can choose infinite rounds as extra option! Fog: If enabled you can't look on other players while building (useful in some modes). Selling: Enables selling of towers you have built (gold and lumber is refunded). Tower bombs: If enabled you get randomly 0-2 tower bombs into the inventory of your builder, which allows you to destroy any tower in your maze. this tower slows the runner by 50% for 5 sec with 5 sec cooldown. Hint: Range and cooldown was taken from the "classic" version made by Pender. 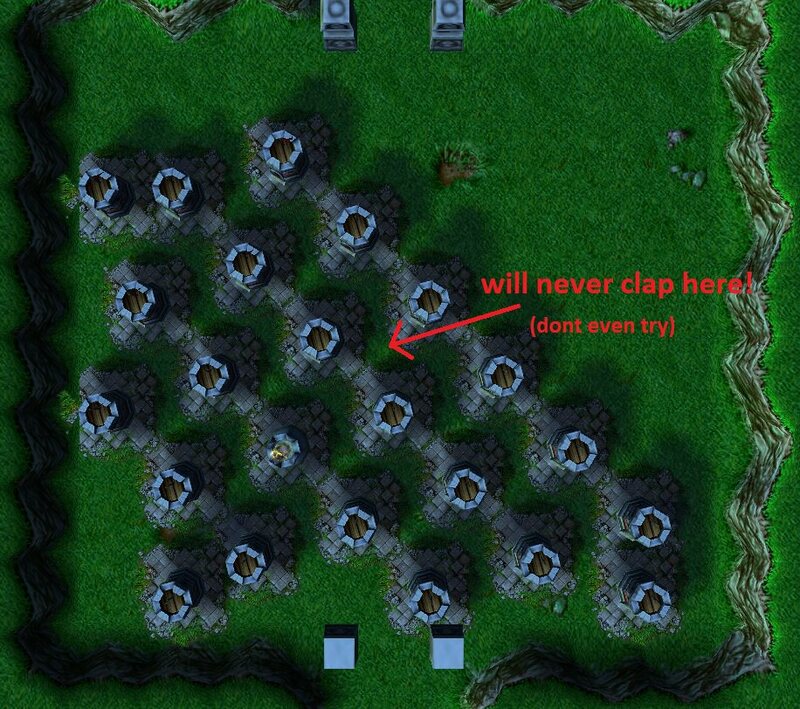 Fans of this so called "mazing contest Final 1.x" will notice an increased difficulty to get more than 2 stomps, but this is how the towers used to work! Speedbuff towers: This towers will increase your runners speed by 50% for 3 sec with a cooldown of 5 sec. The range of their ability is the same as the thunderclap towers slow. Healtowers: This towers cast rejuvenation on nearby runners to fully heal them after 1 sec (also removing the slow effect). The range of this ability is exactly the same as thunderclap or speedtowers. The cooldown of the heal is 5 sec. You wanna place the healtowers to maximize the slow duration of blood loss, just keep in mind that it heals 1 sec delayed! Hint: The speed and the slow debuff are of the same kind, they will negate each other. speedbuff tower and it will revert the acceleration/slow. I added a lot of customisability in this map with the extra game options after selecting the mode. The game will automatically restart after 15 sec and you can choose a new mode to play. The name "mazing contest 2" may be a little bit confusing, because I don't intend it to be a sequel. Its rather an altered version, but I did not come up with a better name than version 2.
fit (or nobody will play it xD). The old intro with an example maze was removed and i implemented a short overview of the choosen settings. I think that everyone, who plays this map will know about mazing contest, so showing the towers and some information to each mode suits better as intro. To get a proper replay mechanism, I also removed the longest maze stuff at the end. Thanks to WTII for testing the 24 player version of this map (version 2.8-3). Added infinite rounds mode for total time option. Multiple fixes for total time mode to get it properly working. Major bugfix with tower bombs. Every unused spot spawned 1 item somewhere on the map. added a huge bugfix to the targeting mechanic of all special towers (thunderclap, speedbuff, healing). These towers will hit now consistent from every angle in 250 distance. removed lot's of useless code from former attempts to fix this. Thanks to everyone who played my maps, you motivated me to implement more features . Please provide Pender's approval of you modifying and uploading his map. I really love what you've done with the game man, though it isn't perfect yet. This mode has a lot of potential, but right now it is lacking. Most rounds are just build your speed towers in a straight line and just spend your remaining gold on the edges. But once in a while you get some really interesting setups. We had one that made you chose one of two paths and had stomper/slower in the end. So basically the smart thing to do was chose a path where you can force the stomper/slower to hit the runner first and the get immediatly followed by your speeder tower. I liked these kind of puzzle like elements. There were other interesting ones too, but I forget, The dynamic of stompers negating speeders and vice versa is really cool. I think you need to find a way to cut out those straight line levels in this mode. Perhaps increase the spawn rate of towers specifically in the middle area so you have to pick 1 of two paths and maybe increase the amount of stompers/slowers to have more strategy. I don't have as much to say for this mode. It is a nice twist on the basic mode. I enjoyed the freshness of being able to play a mode like that, after playing the basic mode for so many years. I guess this will be overlooked until the original author has something to say about it. It's a nicely done game. It could be better if you could make the terrain more appealing. Information about the game(play) is required in the Quest Log. Who made the Runner Model? Credit that person. Would be really neat to have more types of towers. I sent the author a mail, but the original map is nearly 10 years old, so maybe the adress is no longer used. -I tried to keep the map in the same state as the original so fans are not irritated from new terrain. -Some information will be added to the Quest Log (which is empty in the original). -I don't know how to find the author of the runner model, it must be assumed that pender created it. In the import manager its just called "Acolyte~.mdx". -More towers would be nice, but it should fit in the mazing contest setting. I don't really have good ideas that won't make it too complex. and I'm not sure more kinds of towers would add enough to the gameplay to justify the additional complexity." @Eat_Bacon_Daily: I did not focus much on the speedrun mode, but now i made some improvements^^. Try out expect , its in my opinion the best mode . (all modes except speedrun can be set there and i think you dont need more time for speedrun^^). Cool to see some new updates, this is still my go-to Mazing Contest version, I hope you keep improving it! Thank you, but this update is just old stuff i never uploaded. Problem was that speedrun and speedtower had a chance to spawn no special tower, which made some level rather boring. EDIT: removed all the stuff written here. Please don't use tower bombs in version 2.8 there is a major bug which spawns them somewhere on the map. With version 2.8-1 everything is fixed now, also I increased the probability to get some.